1. Bake each layer cake mix by following directions on packages. 2. Cool cakes and cut each cake into two layers (you will have a total of 4 layers). 3. Place one layer of chocolate cake on a serving dish and cover with whipped cream. Arrange slices of bananas, strawberries, pineapple and cherries on top of whipped cream. Repeat this with remaining layers of cake. 4. 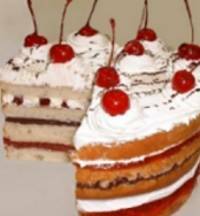 Top cake with remaining whipped cream and decorate top of cake with fresh fruit if desired, then drizzle with chocolate syrup and nuts. It's very delicious. It melts in your mouth.